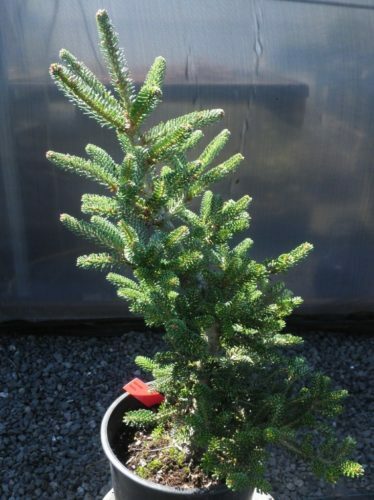 Abies koreana 'Brevifolia' is a slow-growing, semi-dwarf selection of Korean fir. Its needles are notably short and stiff, 0.24 to 0.4 inch (6 - 10 mm) long. Their color is dull green above and gray-white underneath. Typical rate of growth in most areas is ca. 4 inches (10 cm) a year, resulting in a clumpy dwarf tree, 3 feet tall by 1 foot wide (100 x 30 cm) after 10 years in the landscape. J.D. zu Jeddeloh Nursery of Edewecht, Germany introduced this cultivar around 1960. It is noted that because 'Brevifolia' was listed after 1959, it is an invalid name per the international rules of nomenclature. A dwarf conical beauty with dense branching, small foliage and purple immature cones.